Transfers any data between Android and iPhone. Supports to transfer contacts, messages, call logs, photos, videos, etc. . Whenever we move from one device to another, the first thing that we wish to do is transfer our contacts. After all, we can’t communicate with anyone without our list of contacts. Surprisingly, a lot of people find it hard to transfer contacts from iPhone to Android. Truth to be told – there can countless of ways to move contacts from iPhone to Android. You can use a third-party app, a cloud service (like iCloud), and can even use iTunes. Read on and learn how to transfer contacts from iPhone to Android in 7 different ways. Part 1: How to transfer all contacts from iPhone to Android in 1 click? Part 2: How to transfer selected contacts from iPhone to Android? 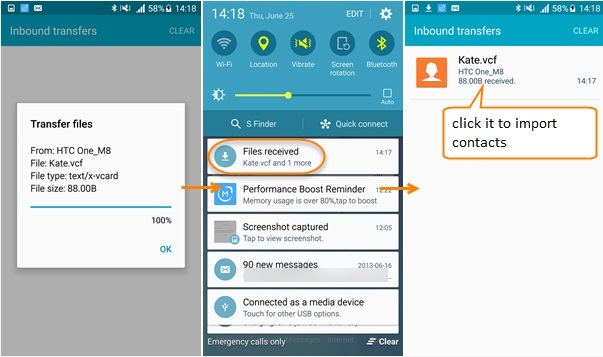 Part 3: How to transfer contacts from iPhone to Android via Bluetooth? Part 4: How to transfer contacts from iPhone to Android with Google Account? Part 5: How to transfer contacts from iPhone to Android with iCloud? Part 6: How to transfer contacts from iPhone to Android using iTunes? Part 7: How to transfer contacts from iPhone to Android without computer? The easiest way to transfer all the iPhone contacts to Android is by using dr.fone - Switch. A part of the dr.fone toolkit, it can easily transfer all your data from one device to another with a single click. The application is compatible with every leading Android and iPhone model. You can transfer your data from iPhone to Android and vice-versa. Besides a cross-platform transfer of data, iPhone to iPhone and Android to Android transfer is also supported. 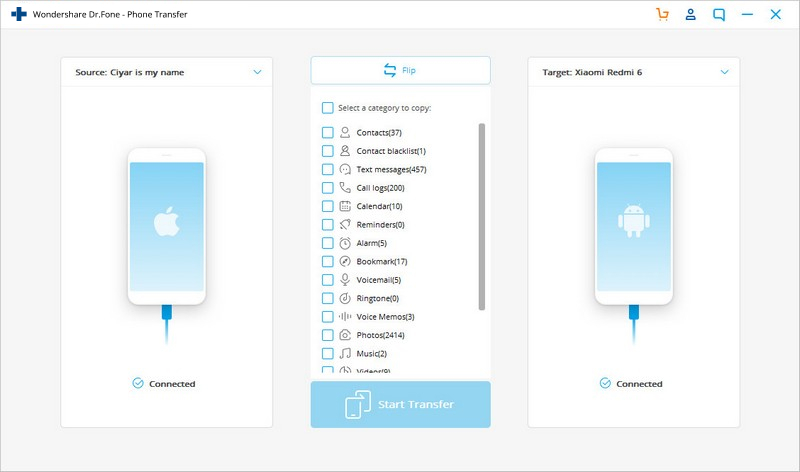 Transfer Contacts from iPhone to Android Directly in 1 Click! Easily transfer contacts from iPhone X/8 (Plus)/7 (Plus)/6s/6/5s/5/4s/4 to Android phone without any complication. 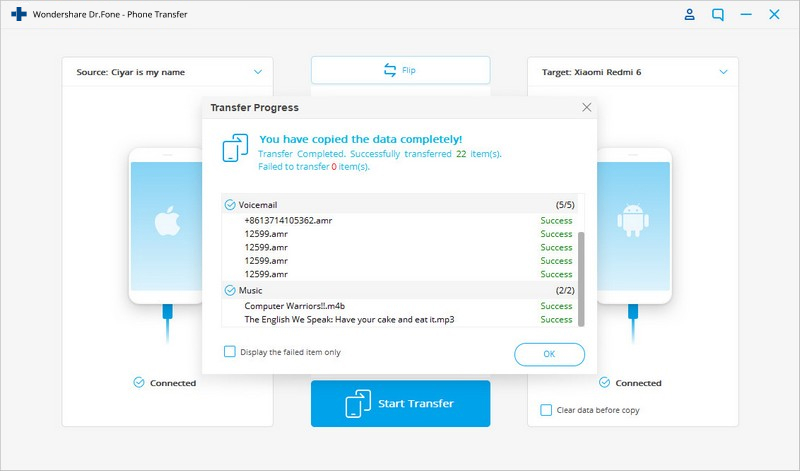 Easily transfer every type of data from Android to iPhone including apps, music, videos, photos, contacts, messages, apps data, call logs etc. First of all, launch the dr.fone toolkit on your Mac or Windows PC and from its welcome screen, visit the “Switch” module. Connect your Android and iOS device to the system and let the application detect them automatically. Since you wish to export iPhone contacts to Android, iPhone should be the source while Android should be the destination device. You can use the Flip button to interchange their positions. Simply select the type of data you wish to transfer. Once you have checked the “Contacts” option, click on the “Start Transfer” button to start the process. Sit back and wait for a while as the application would import contacts from iPhone to Android. Make sure that both the devices are connected to the system till the process is completed. Once the transfer is completed successfully, you will be notified. In the end, you can just remove both the devices safely from your system. With dr.fone – Switch, all your contacts are transferred in one go. Sometimes, users wish to selectively copy contacts from iPhone to Android. In this case, you can take the assistance of dr.fone - Transfer (iOS). 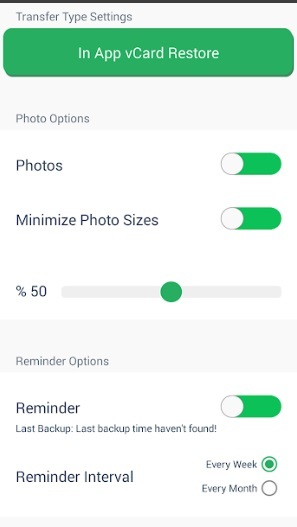 A complete iPhone manager, it will let you move your crucial data between iPhone and computer as well as from one smartphone to another. Fully compatible with iOS 7, iOS 8, iOS 9, iOS 10, iOS 11, iOS 12 beta and iPod. Launch dr.fone toolkit on your system and connect your iPhone to it. From its welcome screen, go to the “Transfer” option. Your phone will automatically be detected by the application and its snapshot will be provided. To continue, go to the “Information” tab from the menu bar. From here, go to the left panel and select “Contacts”. A list of all the contacts that are saved on your device will be displayed here. Now, you can just select the contacts you wish to transfer. If you want, you can preview them here as well. Additionally, you can select all contacts at once too. Click on the export icon on the toolbar and choose to export the selected contacts to either a CSV or a vCard file. Ideally, a vCard is recommended to transfer contacts to other devices. In the end, you can just connect your Android phone to the computer and manually move the vCard to it. Later, you can simply import contacts from the newly transferred vCard. 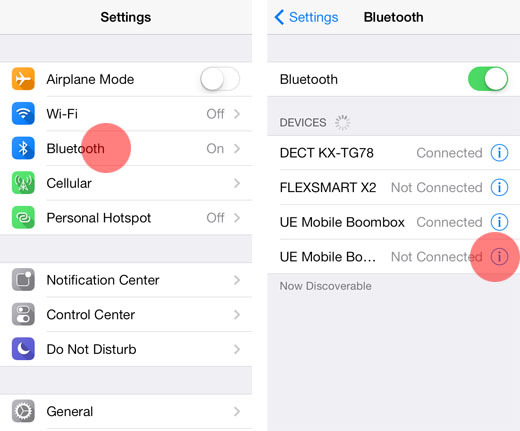 Firstly, turn on Bluetooth on your iPhone from its Control Center. 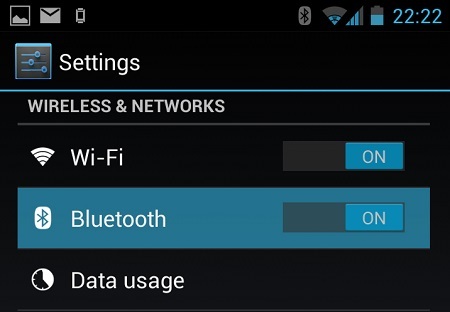 You can also go to its settings and manually turn the Bluetooth on. In the same way, go to your Android device’s settings or notification panel and turn on Bluetooth. Make sure that both the devices are located in close vicinity. On your iPhone, select your Android phone from the list of the available devices. A one-time unique passcode should be verified to connect the devices. Once both the devices are connected, go to your phone’s Contacts app and select the contacts you wish to send. After making the desired selections, tap on the Share option and choose the connected target device. On the destination Android device, you will receive a prompt for the incoming data. Simply accept it and import the file to complete the transfer. Another fast and hassle-free way to sync contacts from iPhone to Android is by using your Google Account. Since you can add your Google account on iPhone, you can also use it to sync your contacts as well. While setting up your Android, you can simply use the same Google account. To learn how to import contacts from iPhone to Android using your Google account, these quick steps can be implemented. Unlock your iPhone and go to its Settings > Mail, Contacts, Calendars > Add Account and tap on “Google”. Sign-in with your Google account credentials and grant your phone the needed permissions to access your Gmail data. 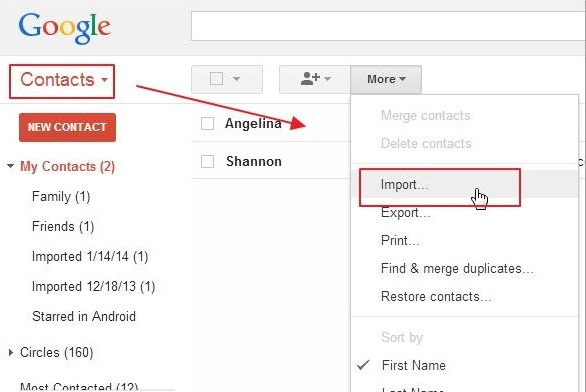 Now, you can go back to your Google account from here and turn on the sync option for “Contacts”. Once your contacts are synced with your Google account, you can easily access them on any Android device. You can use the Google Contacts app or simply use the same account to set up your device for auto-sync of contacts. 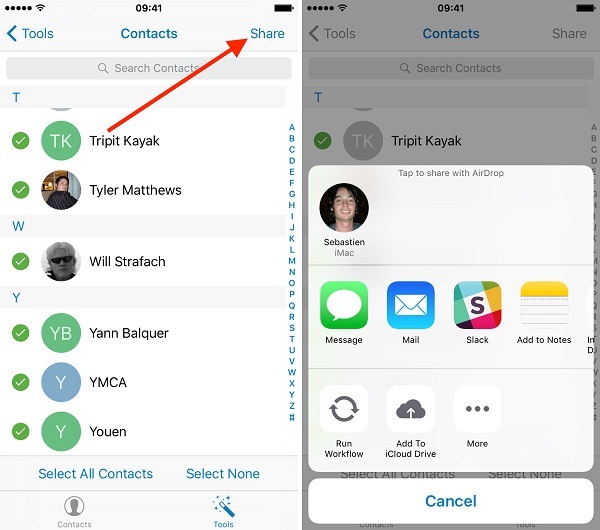 Another simple way to sync contacts from iPhone to Android is by using iCloud. Firstly, you need to sync the iPhone contacts with iCloud and later you can export them a VCF file. In this end, the vCard can be imported to Google Contacts. Yes – it does sound a bit complicated. After all, the dr.fone tools provide such a hassle-free way to move contacts from iPhone to Android compared to this technique. Though, this is a free solution and can be your plan B. To learn how to transfer contacts from iPhone to Android via iCloud, follow these steps. 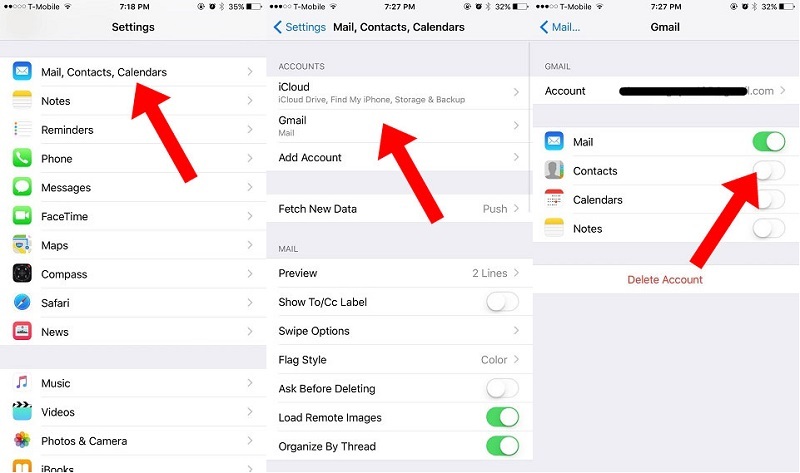 Before you proceed, make sure your iPhone contacts are synced with iCloud. To do this, go to the iCloud settings and turn on the sync for Contacts. Great! 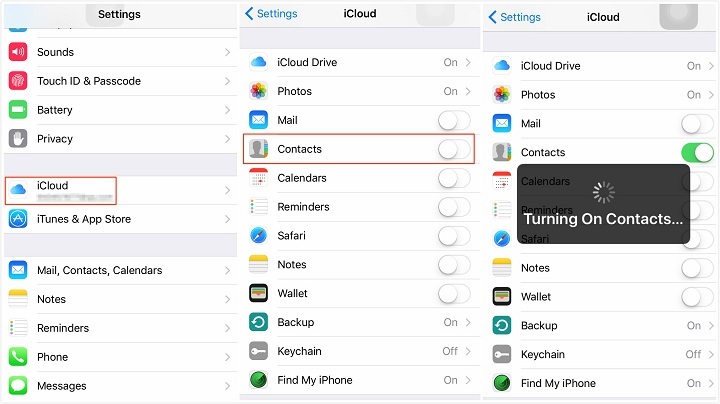 Once your contacts are synced with iCloud, you can easily access them remotely. 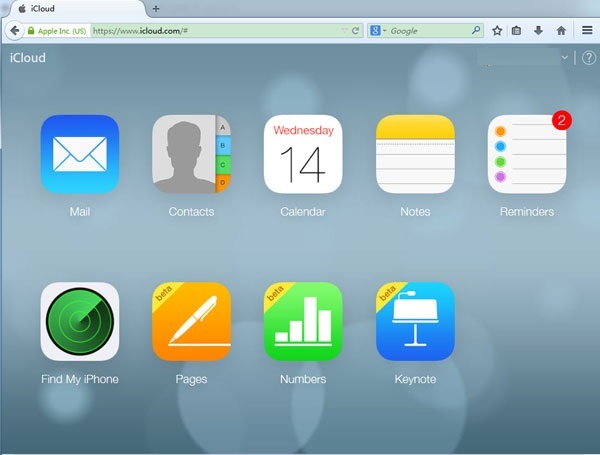 Go to iCloud.com and log-in with your Apple ID. 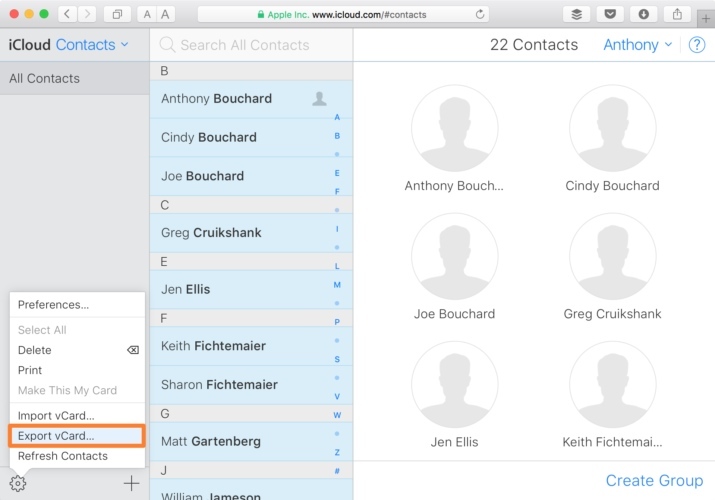 After logging-in to your iCloud account, go to the “Contacts” option from the home screen. This will display a list of all the synced contacts. Simply select the contacts you wish to move. To select all contacts, click on the gear icon (settings) at the bottom right corner. Once you have made the desired selections, simply go to its settings again (the gear icon) and choose to “Export vCard”. This will save a VCF file having all the contact details. Now, go to Gmail and log-in with your account details. Select the Contacts option. Alternatively, you can go to the official website of Google Contacts as well. From here, you can choose to Import a file. Click on the vCard option and browse the saved VCF file that you have just exported from iCloud. Once you have imported these contacts to your Google account, you can easily access them on the connected device as well. If you are an avid user of iTunes, then you can try this technique to export iPhone contacts to Android. 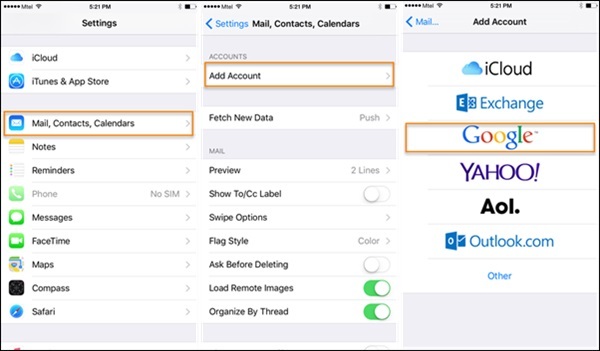 Earlier, iTunes has a feature to sync contacts with Google, Outlook, and Windows account. Now, the Google feature has been removed from iTunes. Therefore, you first need to sync your contacts to your Windows account and can later export them into a vCard. Needless to say, the technique can also be a bit complicated. Though, you can implement these steps to copy contacts from iPhone to Android using iTunes. Launch an updated version of iTunes on your system and connect your iPhone to it. Select your connected device and go to its Info tab. 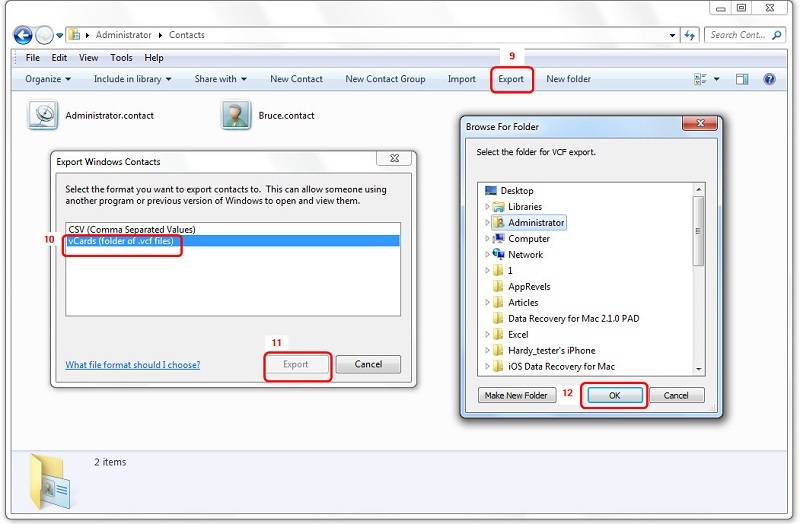 Enable the “Sync Contacts” option and choose to sync them with Windows Contacts. Make sure that you choose to sync “All Contacts” before clicking on the “Apply” button. Great! 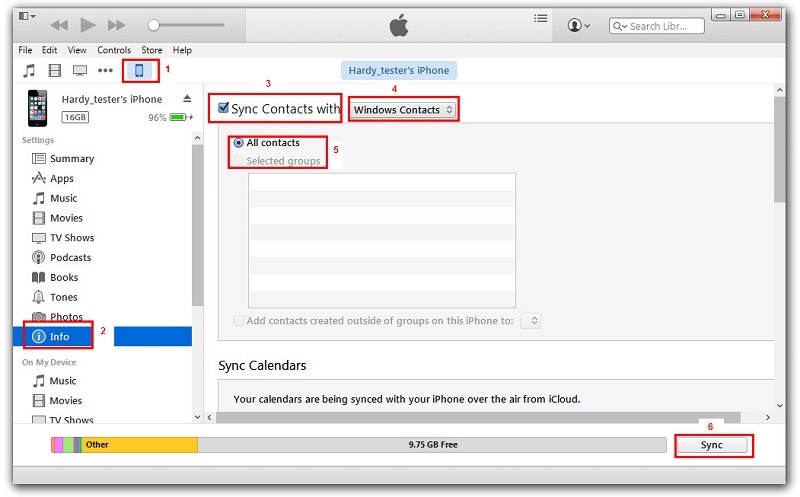 Once you have synced your iPhone contacts to your Windows account, you can safely remove the device. Go to your Account > Contacts and click on the “Export” button on the toolbar. Choose to export the contacts to a vCard and select the location to save the VCF file. In the end, you can manually copy the VCF file to your Android device or simply import it to your Google Contacts as well. A lot of times, users don’t wish to use a computer to export iPhone contacts to Android. If you have the same requirements, then you can simply use a data transfer app. While there are lots of apps out there that can help you move contacts from iPhone to Android, I would recommend My Contacts Backup. This is because the app is available on both, iOS App Store and Google Play Store. To use this app to transfer contacts from iPhone to Android, follow these steps. Firstly, download the My Contacts app on your iPhone and launch it. Grant the app the needed permissions to access your contacts. 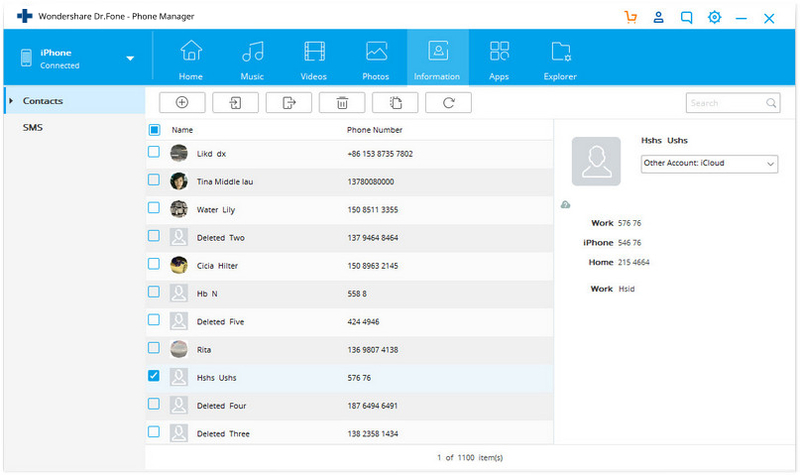 The app will automatically detect all the contacts saved on your device and would give you an option to either mail them or save them to its server. You can choose to email the contacts to your own Gmail account as well. A VCF file will be mailed to your account that can later be downloaded and synced. Additionally, you can also upload the contacts to its server. Now, you have to install the My Contacts Backup app on your Android device as well from Google Play Store. Launch the app and choose to restore your contacts using an in-app vCard. In this way, all the saved contacts will be exported to your Android device. Now when you know 7 different ways to move contacts from iPhone to Android, you can easily fulfill your requirements. Out of all the provided options, dr.fone - Switch is the fastest and most convenient option to move all the contacts at once. Though, if you wish to selectively copy contacts from iPhone to Android, then dr.fone - Transfer (iOS) can also be used. Go ahead and try these amazing tools for free and move from one device to another without any trouble. No need to go any further to import photos from iPhone to Windows 10, as we have listed the top 3 ways to transfer iPhone photos successfully. Many people want to know solutions on how to transfer photos from laptop to iphone. Find in this article three of them to best satisfy your needs. Don’t know how to transfer videos from PC to iPhone? Read this informative guide and learn three different ways to transfer video from PC to iPhone easily. Already decided to ditch iPhone and switch to Samsung flagship smartphone? Here's how to transfer all your data from iPhone to Samsung in 6 handy ways. This article introduces how to delete playlists from iPhone with the help of three helpful solutions. All the solutions will help you to get the work done easily. Wish to change iPhone wallpaper? Here is the complete guide on how to put wallpaper on your iPhone. Do not know how to transfer your favorite Podcasts from iPhone to computer for backup? Follow the steps in this article.